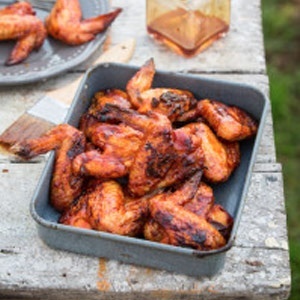 Pat the chicken wings dry with paper towels and mix together the baking powder, peri peri, paprika and salt. Put the wings and the spice mix in a bag. Shake to coat all over. Line a shallow dish with several layers of paper towel and arrange the wings on top in a single layer. Leave the dish uncovered in the fridge overnight, but if you’re short of time 2 hours will suffice. Blitz together all the ingredients for the sauce and set aside. You need cool coals to braai the wings slowly and then hot coals to char them at the end. Scrape most of the coals to one side of the braai. On the cool side, on a clean oiled grid, braai the wings skin-side down at least 20cm above the coals for 30 minutes. Baste the wings with the sauce, drop the grid and push some hot coals under it. Keep turning, basting and braaiing until the wings become sticky and nicely charred. Remove and let everyone help themselves.